Sticky Rice is the first new restaurant to open in the market this year. 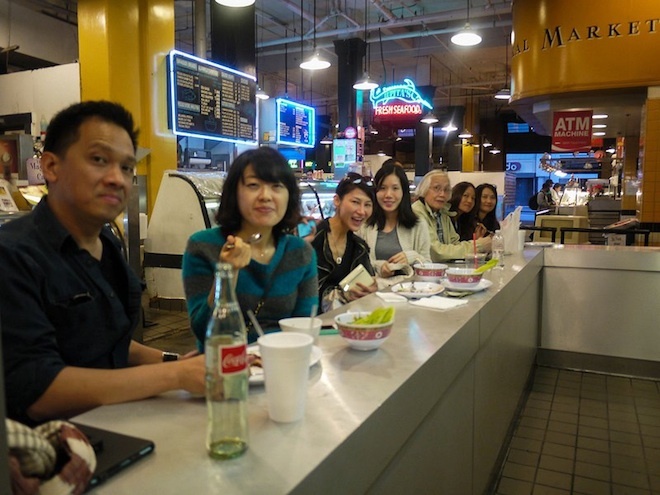 Since 1917, Grand Central Market has been a hub for eating, drinking and meeting in downtown Los Angeles. In recent years though, it has felt more run down and dirty than resourceful and tasty. This year marks a kind of rebirth for Grand Central Market. The Yellin Company is behind the Market’s transformation, which includes structural as well as tenant changes. The vision is more San Francisco’s Ferry Building than Farmers’ Market, according to people familiar with the design firm who has been hired on to do the refresh, BCV. Sticky Rice is the first new restaurant to open in the 27,000 square foot market; it’s an offshoot of nearby Soi 7. Under the leadership of owner David Tewasart, Sticky Rice started serving home-style Thai comfort food earlier this month. Their Grand Opening is next week, on April 30. The first 100 people to visit Sticky Rice get a free Thai iced tea with their order. Starting this June, a new restaurant will open inside Grand Central Market each month. G&B Coffee, Valerie Confections, a Central Texas BBQ restaurant called Horse Thief and Oyster Gourmet, a new shellfish bar, are all set to open this year. It’s a new day for the market at the foot of Angel’s Flight. Previous articleWhere Is The Center Of Los Angeles?